For as long as I can remember, I have loved to plan parties. I can remember planning events in my local community with my parents when I was only 8 years old. A good party runs in my blood! I continued to plan and organize throughout high school and went on to work for an event venue in college. So, when I came time for my son’s birthday, you can bet I was excited. 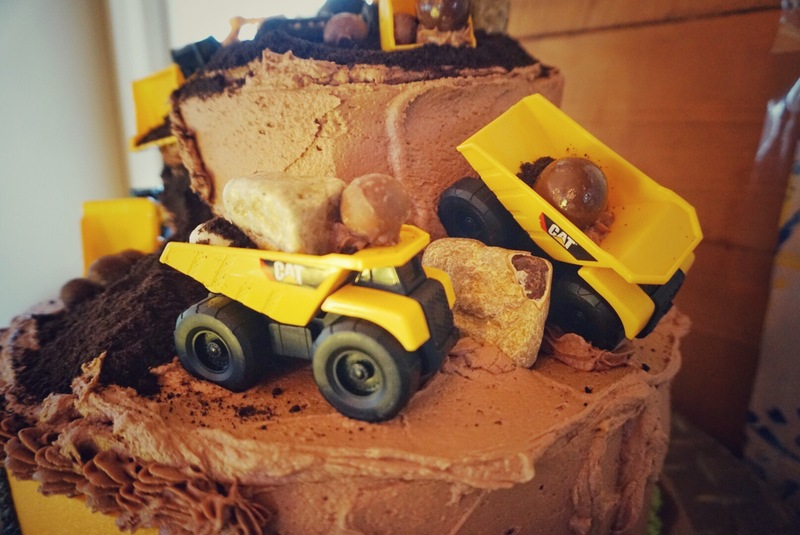 This year’s theme was all things, CONSTRUCTION! I’d say it narrowly beat last years “Lumber Jack” theme. When I began to dream of the party, I created a page in the “note” app on my iPhone. From there, I organized and kept track of ideas that came to me. I also started boards on Pinterest and searched on Etsy. The inspiration was ENDLESS! I always think of a color scheme and hold myself to items that fit within this scheme. To create great ambiance, I used bright orange, yellow and blue table cloths, which helped to form the color theme throughout the decor. Two bright blue bolt bins for the cupcake stand. It’s amazing what you can find if you squint a little and try to imagine what it would look like after a good scrubbing! 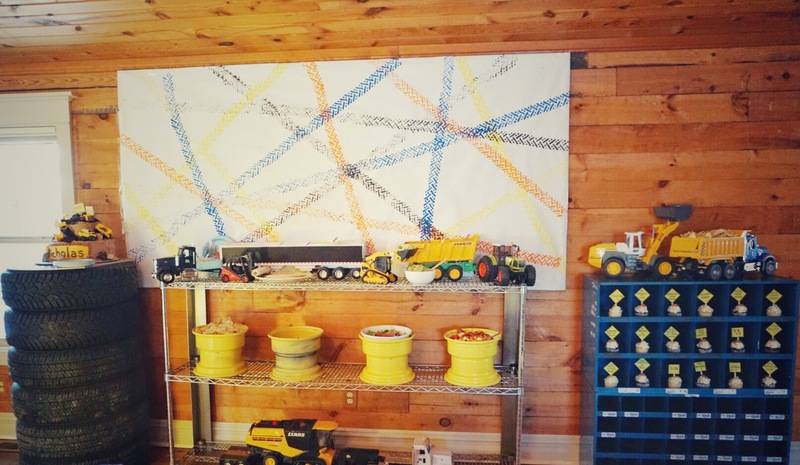 For the backdrop behind the buffet we dipped remote-control car tires in paint and then rolled them across the paper, simple and oh-so-fun! Then we went around the house and found all of the toys that went along with our theme and gave them a good bath in the sink. 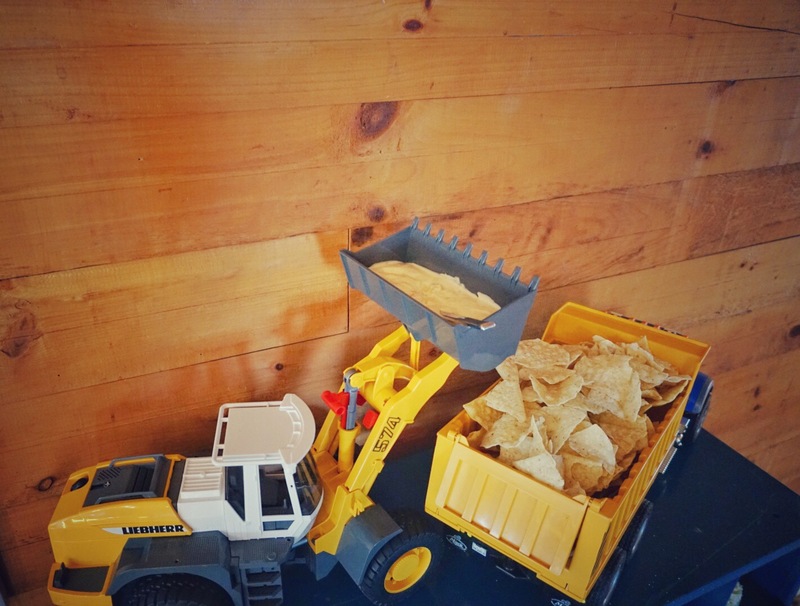 Chips and dip from a loader and dump truck? Why not? 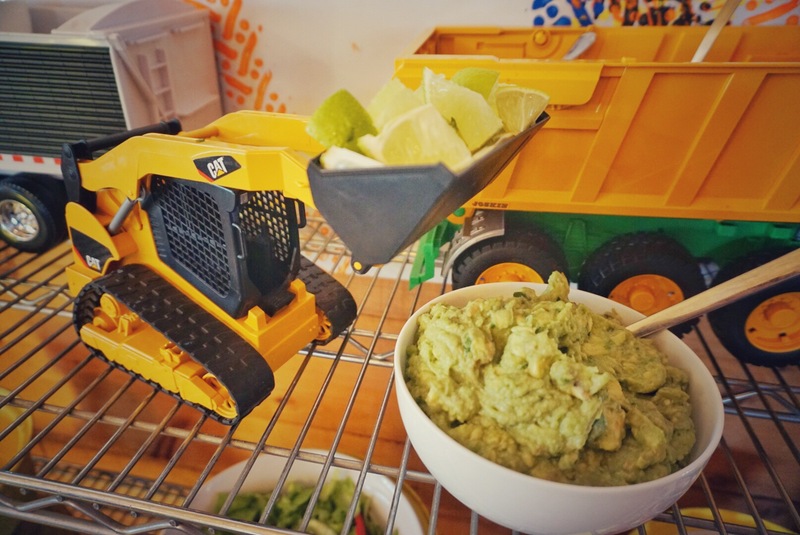 Limes and guacamole from a bobcat loader? Sure! 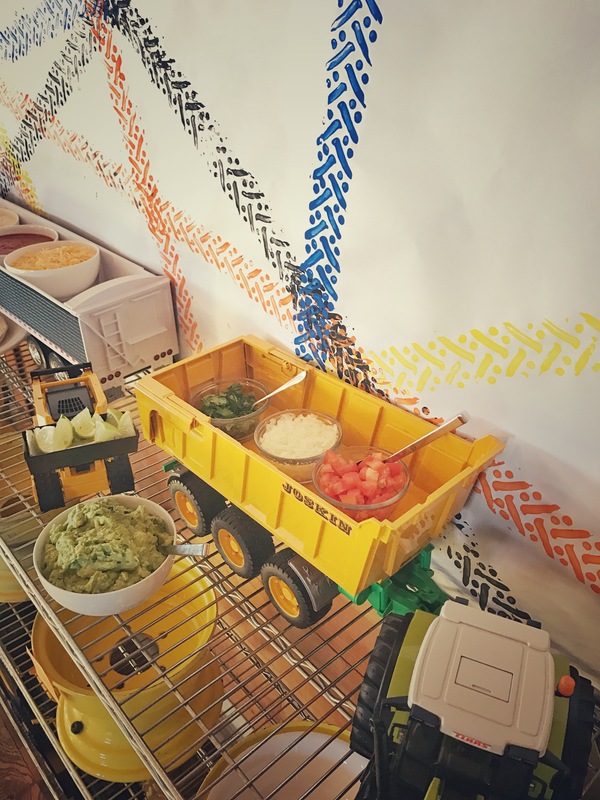 All of the toppings were served in the toy equipment we had. 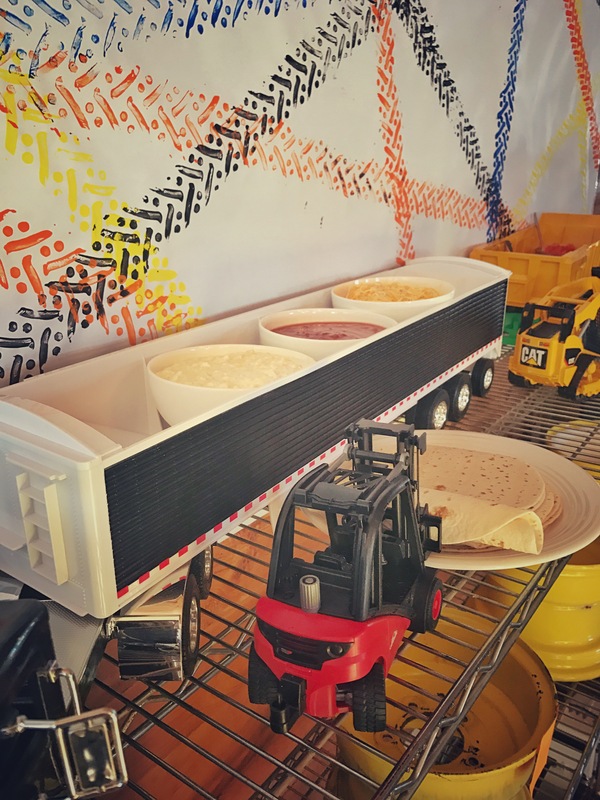 We also had a “Refueling” station. 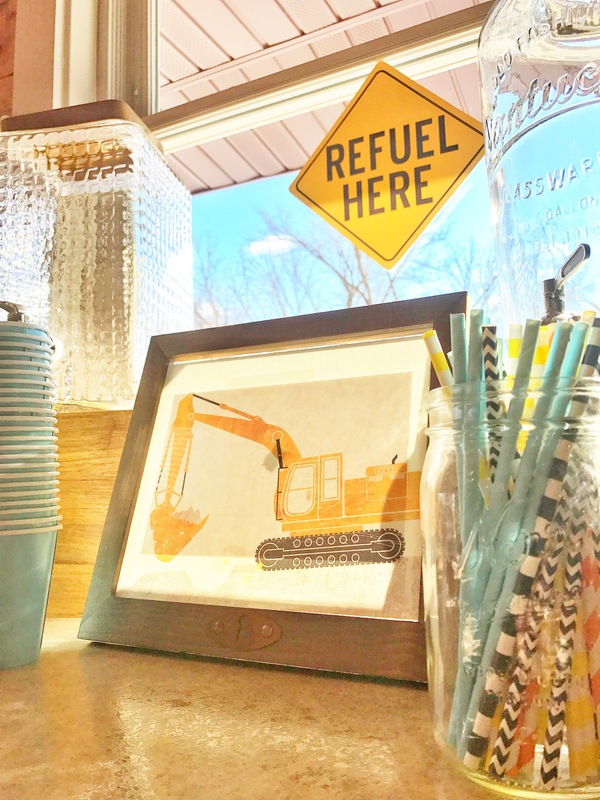 Additionally, throughout the party I had frames with beautiful prints of heavy equipment from Kastner Illustration on Etsy. These prints, and the rest of the decor, are merely tools to set the stage for the most important part of an event, creating a shared experience for people which in turn creates memories. I’ve learned that this is the most important part of the whole event for me. The more people get into the theme, the stronger the memories will be! So I try and get people engaged from the very beginning. I love it when people go all-in and embrace the theme. 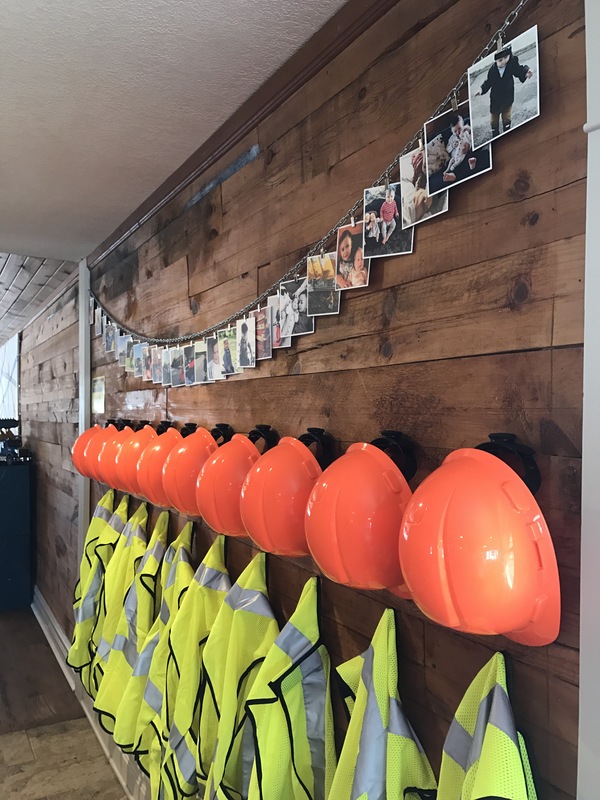 We had real construction hats and vests available for everyone when they walked in. They were definitely a hit! Above the hats and vests were 5″ Photos from Social Print Studio, hung on a small chain found at Home Depot from these clips. I ordered enough photos so that as people were leaving they were welcomed to take any photos that they wanted. I also created a hardcover album of the very best photos of the year from Social Print Studio. The quality is amazing and it is such a great tradition. 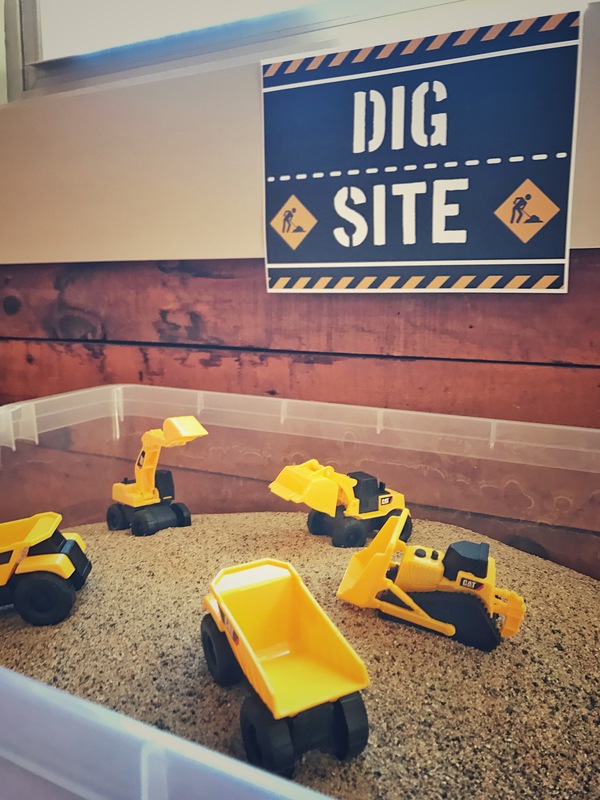 To make the sandbox I used a low Rubbermaid container from Target and filled it with play sand from Home Depot. I put it on top of a low table for the best access. 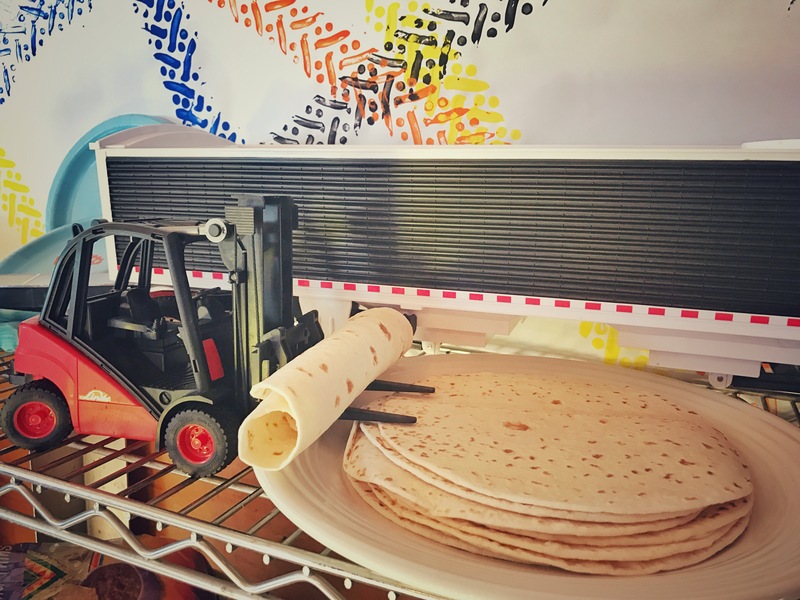 We also had a few more activities for the kids, which is an important aspect of any party- keeping the kids engaged. 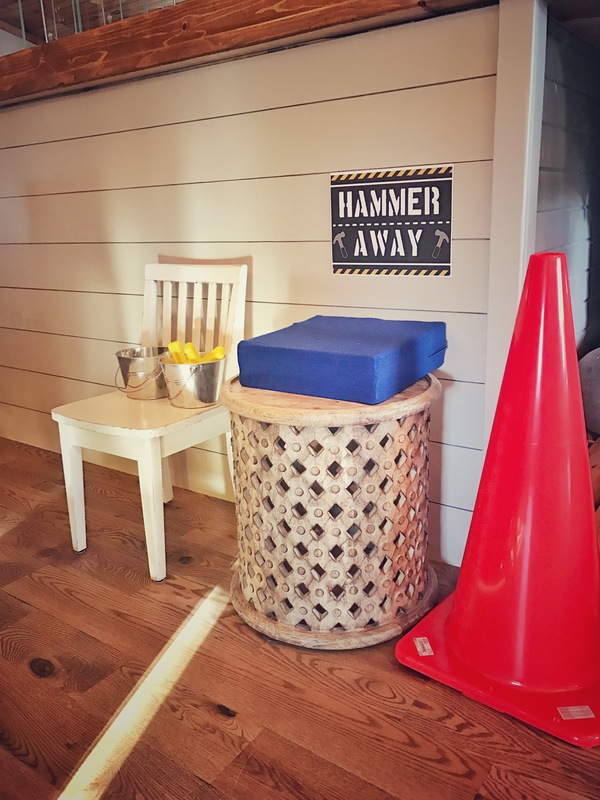 A super safe hammering station. And a craft table with stickers, play-doh, and temporary tattoos. 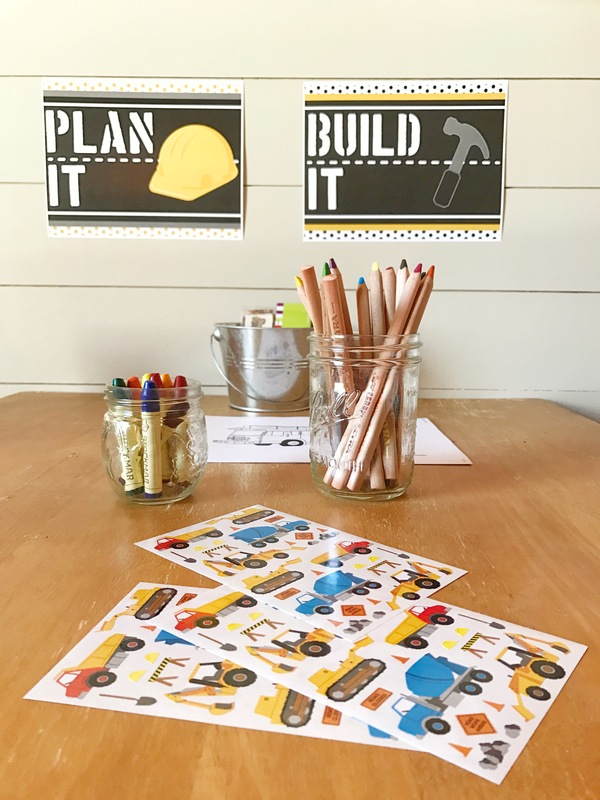 I also printed some construction themed coloring sheets from a free website online, found with a simple google search. The grand finale was, of course, the cake. 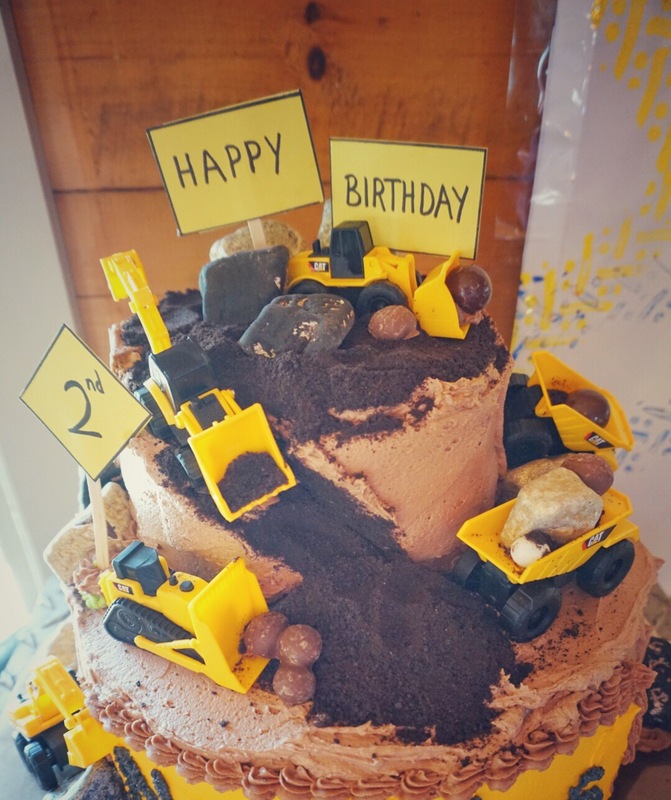 It was made by a local baker, with inspiration from Pinterest. As we sang “Happy Birthday,” my heart was so full it could have burst. 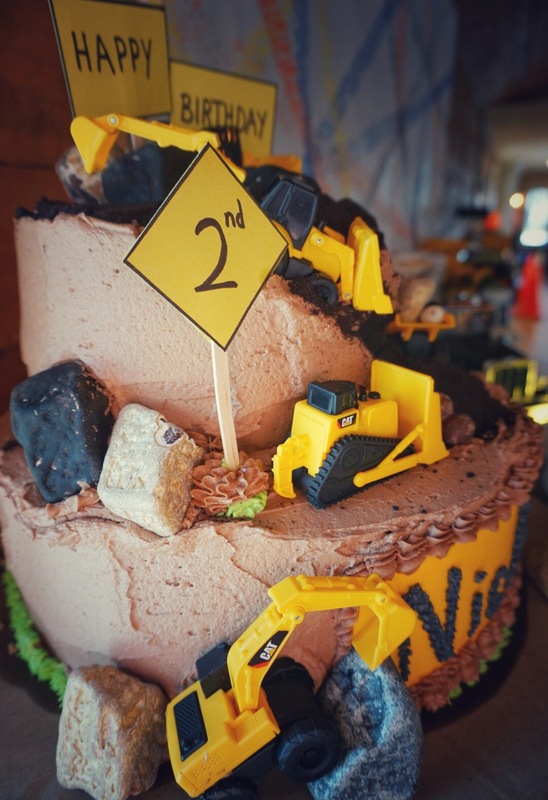 Surrounded by family and friends, we were so proud of all that our little birthday boy had accomplished in the last year and how far he had come. We were ushering in a new year of growth and we were doing it together, with love and laughter. Thank you for taking the time to read my post! I’d love to hear about your favorite party, let me hear about it in the comments below. Also, I’d be happy to answer any questions you may have! PS- Lumber Jack themed party post coming soon! This looks like the best party ever! I always loved having wax lips at my birthday parties as a kid. Have fun with your new blog! Oh my goodness, WAX LIPS! What a blast from the past! Thanks for sharing! Thank you, Katie! It was such a fun party! I love your attention to detail and how it all came together. WOW! It’s making me wish I were a kid, it looks so fun. Amazing, inviting, and inspiring! Can’t wait to see the next inspiration spark! Thank you, Courtni! I’m so glad you enjoyed the post. 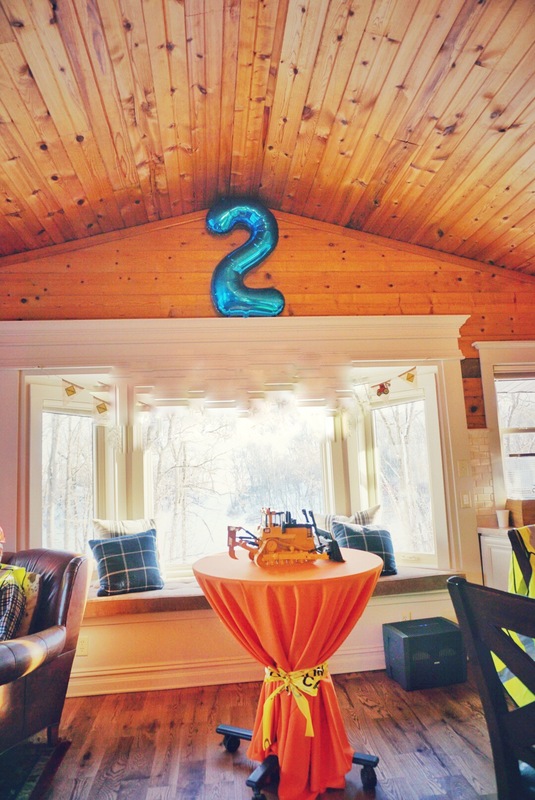 Party planning is so fun! I can’t wait to share the Lumberjack theme party we had.